Kona Magic Sands#313 is a DIRECT oceanfront, TOP floor condo that is meticulously maintained, beautifully furnished, and has absolutely anything any guest could dream of. Wifi, Air Conditioning, beach gear, you name it, the condo most likely has it! This third floor condo has such a beautiful view! Sit on your lanai and sip mai tai's or just hang out to watch the sunset. Great whale watching during the winter months! Peaceful,serene and full of loving memories. Loved the sound of the crashing waves and body surfing at Magic Sands Beach. The unit had all the comforts. Mahalo for the kind review, Lauren! We're glad you had a memorable stay at Kona Magic Sands, and hope to see you again soon! Wonderful well maintained property. Great location and great vacation! Aloha Liz, thank you for staying with us at Kona Magic Sands 313. We're glad to hear you enjoyed your stay and the location. We hope to have you again soon. Mahalo! This studio was perfect! Only 3 units have a lanai and this is the best, because of the thoughtful lanai furniture. Regular table height puts the railing at eye level, but the bar height chairs provide an unobstructed view. The loungers were very plush. All snorkel and beach gear provided. The unit is actually much nicer than the photos here suggest. Bathroom and bedding is updated, kitchen is not. Very small kitchen, but perfect for a quick meal. Fridge is large and microwave is fine. AC works well and is naturally noisy, being close to the bed, so we slept with earplugs. The waves are also noisy, but pleasant. The shower is compact, but not too bad. The stairs and hallways are carpeted, so you can come barefoot from the beach. We never heard a sound from neighbors, as this is a top floor unit. 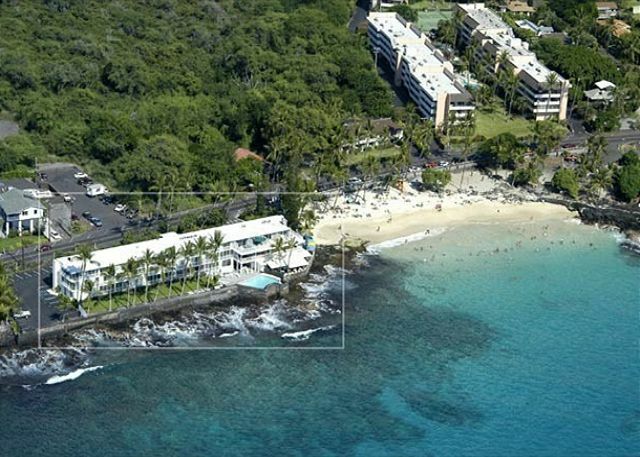 The location is fabulous, just south of town next door to the best beach in Kona! Brilliant snorkeling right in front of the room. Grocery store a 5 min drive south to Keaohou. Management was very responsive to questions, even on a Friday night. (The WiFi info you are emailed is not current, but it’s posted in the room. The smartTV is wonderful. The Studio was perfect. It was well laid out, clean, comfortable and generously stocked with everything you need. The kitchenware was lovely. The pots and pans were clean and well cared for - which we used for a hearty breakfast daily. The beach toys including snorkel gear was thoughtfully available to enjoy. Our time spent on the lanai was comfy and wonderful. Fantastic views! The shower is small. However, ample. When we return, we will be staying in #313 again. Room 313 was amazing! Unobstructed ocean front, saw honus, fish, dolphins from our lanai. I can still hear the ocean! Beautiful sunsets, BBQ, swimming, etc. Room Came with boogy boards, snorkel gear, comfy beach chairs, beach towels, hair dryer. Equipped w/coffee maker and grinder also! There are only 3 rooms w/extended lanai. Highly recommend this room! Owners contacted me during our stay and at the end of our vacation. We miss room 313 already! We will be back!! The best thing about this condo is watching the surf come in while sitting on the balcony. It pounds a wall that is only about 20 yards from the building. The worst thing about the place is trying to sleep with the loud sound of the crashing surf that never stops through the night. Also, this is a very small unit and the shower was too small for a big guy like me. I had to use the shower at the pool. Otherwise, is is a great place. After year 3 of staying at this property, we will be back again! (KMS #313) "Home away from Home" for 2 in the Best of Paradise! Karne B from Broomfield, Colorado does not recommend this vacation rental. Everything about this experience was simple!! Loved the app! The unit itself was wonderful. Tiny, but the location couldn't have been more perfect. We would stay there again in a heartbeat. We missed it the second we left. It wasn't spotlessly clean. It was tidy and the housekeepers do a good job of cleaning up after guests, but it needs a good cleaning. I could see dust bunnies peeking out under things. I would recommend this unit to anyone who was traveling alone or as a couple. Stayed in May for eight nights, loved it very much.View from lanai is incredible. We saw colorful fish, turtles, dolphins from there and enjoyed sunset. Unit is all, but enaugh for two people. Great place. I've never spent so much time on a Lanai totally relaxed watching the waves roll in. The place also had a lot of little touches that made it awesome...small travel cooler, ice packs, lemon squeezer, good pans and knives, new lanai chairs. The condo itself is VERY small. You can't take a shower if you don't like small spaces. However, the view is spectacular and the place was nicely decorated. It is nice to sit in the room or on the balcony and listen to the waves. The water was so clear that we could see the fish swimming in the waves right in front of the condo. The owners have thought about just about everything and furnished this place beautifully. We slept with the door open to the sound of pounding surf (which is loud - if you don't like it you can close the door). The kitchen is really well equipped, which made it easy for us to fix nearly all our meals at "home." The beach next door may not have sand, in which cases going into the crashing surf amidst rocks can be a bit dicey. But there is a year-round sandy beach about 1 mile south. There is a trolley service that stops right in front of the condo, but if you have a rental car you probably won't need it. We would definitely rent this place again! Wish we could have stayed longer---just loved our stay..great to have used the boogie boards, umbrella and comfortable beach chairs. Each morning enjoyed whale watching on the deck. Great, safe location. Thanks again. Awesome location and amenities, can't wait to return! So many whales, dolphins and colorful fish views from the lanai. Location is EVERYTHING! A small, but very comfotable unit. Well equipped kitchen was a must for us and this place delivers....we even added a couple new items and left behind for all to share. View from the unit was spectacular. Unit was clean and comfortable. On site property manager was helpful whenever we needed anything. From the property description we thought a washer & dryer were in the unit however it was a coin op on the lower floor. Overall we were very satisfied and would go back. The ocean view was beautiful; however the place was not as clean as expected. There were ants roaming around the bathroom sink. The bathroom was tiny and the bed is lumpy. You are paying for the view. The place need to be remodel. Had a good time there. Front beach, good for the prive. Don't expect modern or new furniture, don't expect perfect cleaning(towels were stinking), but good overall. The air conditionned is very noisy so you don't sleep with it on, and the waves from the laina are really noisy, so you might like to be hot to sleep! GREAT LOCATION! Right ON the ocean! (surf volume is variable,loved sleeping with the sliding door open) Comfortable Queen Bed, great casual island decor & rocking lanai chairs outside to have morning coffee & watch the turtles, fishes & dolphins. (How may places have that amenity? )A well appointed kitchen,big fridge, a very small bathroom, but plenty of hot water. A beautiful beach next door & the best sunsets from your own deck! Cooler, fins, boogie board,beach chairs. Wonderful experience! It is a PARADISE FOR TWO, we can't wait to come back here! Great location - enjoyed watching the sunset on the Lani - so close you can see the fish as well as the whales in the distance. Kitchen was well stocked. It is small - 2 people max. Shower was quite small with warm/not hot water and low water pressure. Thanks for a memorable stay in Kona. We loved this place. Best beach for snokling and sun. Condo had beach chairs, umbrella, and fins. The resterant on the property was good. Needed ear plugs because the ocean is right there and a bit loud for me. THE BEST. I WILL NEVER FORGET OUR STAY AT THIS LOVELY CONDO INCLUDING THE LANAI, THE VIEW. THE MANTA'S THE DOLPHINS, THE TURTLES, THE BIRDS. THE SUNSET. THE CHAIRS AT THE HEART WILL NEVER LEAVE MAGIC SANDS 313! Having lived in Kona this location could not have been better in fact it was perfect. The view million $$$$. KMS 313 is dated but clean very local in feel, could have used more storage space. My wife (security conscious)the sliding door needs to be fixed. It was hard for a 150 lb person to take a shower. This is our second stay here in two years and with a few improvements in furniture it was even better. Wonderful location, sights, sounds. The morning we left we sat on the balcony and watched the dolphins jump and spin right in front of us. (not the first time). We do not think there is a better place on the island. Was extremely impressed with the presentation, cleanliness, comfort & all the extras provided in the unit. It says a lot for the owners of the unit, would love to meet them, my kind of folks. Will recommend this unit highly. Nous avons adorés notre séjour au Kona Magic Sands... comment ne pas apprécier les petits déjeuners sur le lanai en regardant les poissons tropicaux. Kona Magic Sands sera encore notre choix d'hébergement lors de notre prochaine visite à Big Island. Had everything we needed for a lovely time. A wonderful place and a great bargain! For us, even a resort could not compare to this comfortable unit, with its lovely, retro-tropical decor, right on the ocean. It was hard to tear ourselves away from the open lanai to do anything else! We would stay here again any time we had the chance! We were very satisfied with with our stay with you. We had a very nice time. We love Hawaii. Thank You. This was the first time I ever rented a condo via the internet. The pictures were spot on. The view was the best. The kitchen was a bit dated but had a large new fridge. The bathroom shower was tiny but you could get yourself clean & thats all that matters. The open lani was only one of three in the units. We loved watching whales, turtles & spinner dolphins all from the comfort of the nice wicker glider chairs. I wish we could have booked for longer. we thought this property worked great for our stay every body has differnt taste or ideas for what they want. Great place, great location to stay for 2 ,Kitchen well equiped, liked the big fridge, enjoyed the beach chairs, umbrella, coolers and boogy boards. We absolutely loved Kona Magic Sands unit 313! I hope we can go again. The place is small, but fantastic location and everything needed for two people. Sitting on the balcony and watching the ocean right in front of you was fantastic. You could not find a nicer, prettier spot on Kona. Very satisfied with the whole process. Having an open lanai was a great feature. Meals on the lanai watching the sea are wonderful! Amazing location for ocean lovers- you can watch fish, turtles, dolphins, whales as well as body-surfers on the beach right from the balcony and fall asleep to the sound of the waves ( you can close the sliding door if you are a light sleeper,it has an air condition ). The condo is small but it is clean and has everything you need. The best part of this property is the location, the worst part of this property is the location. This unit had a balcony, most do not, which was a nice place to relax and enjoy the spectacular view of the ocean. Unfortunatly you are so close to the water that the noise can be a bit loud. Luckely this unit has an air conditioner, the unit next door did not and the couple staying there complained that it was very hard to sleep at night, because they had to keep the door open. Overall id say the unit is a bit small, was a little dirty, and the bed wasnt the most comfortable, but the view helps to overcome most of the negatives. Next time i visit Hawaii, I think I'll look for something just a bit further back from the water.